For me, coleslaw is the ultimate autumn dish. Something that says, “Summer is over, fall is here”. It is a dish so unique in its simplicity that it always blows my mind how easy it is to make, how tasty it is, and also how easily you can change the taste by switching some ingredients in the dressing. A truly wonderful salad that I usually serve as a part of bigger salad table or with some meat or potatoes or sausages or anything else we have (even salmon is perfect with it). It is interesting that today, when we think about coleslaw, we think about cabbage that is dressed with white sauce, but originally (since ancient times) it was shredded cabbage with vinegar sauce and eggs. Coleslaw, as we know it today (with creamy mayonnaise sauce), was invented only in the 18th century by the Dutch and the name is an Anglicization from the word “koolsalade”, when immigrants went to America. It was only then, when mayonnaise was invented and when they decided to mix it with cabbage (as you can see it was already in the 18th century when people started to put mayonnaise in way too many dishes) that we got the dressing we know today. 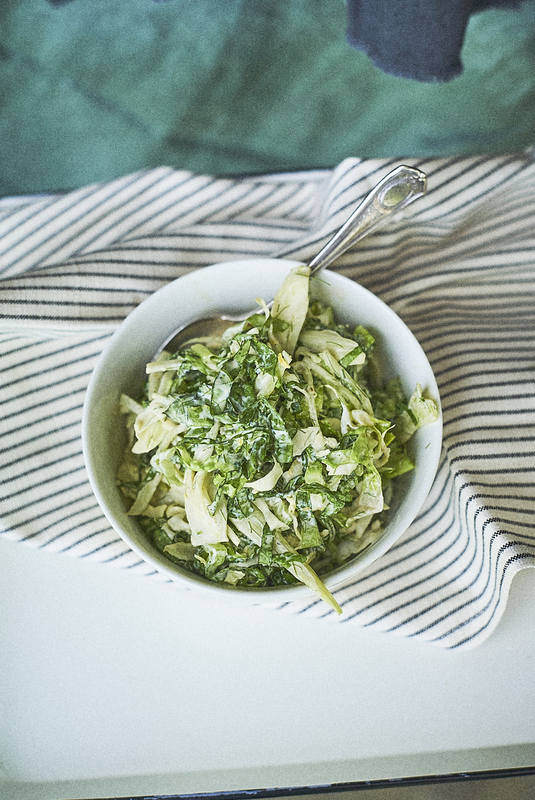 Toss the pumpkin, cabbage, romaine, fennel, basil, chives and parsley in a bowl. Make the sauce. I like to make it a few hours or even a day before, as it gives time for the flavors to meld together. Whisk together the ingredients for the sauce in a small bowl, leaving the salt for last. Add salt, taste, let stand for 20 minutes, and taste again. Add more salt if needed. 1 or 2 hours before serving, pour the dressing over the shredded veggies, toss gently to combine, making sure all the shreds are coated evenly. Put the bowl into the fridge and leave for 1-2 hours. Serve as you wish.